Heliyon welcomes research across all disciplines. Any paper reporting original and technically sound results of primary research, which adheres to accepted ethical and scientific publishing standards, will be published regardless of its perceived impact. Our dedicated expert editorial team, together with an editorial board of over 900 active researchers, from all disciplines, ensures that papers move through to publication as fast as possible without compromising on the quality of the process. Every published article will be immediately available on both Heliyon.com and ScienceDirect, and will be indexed by PubMed, Scopus, and Web of Science™ Emerging Sources Citation Index (ESCI), ensuring it reaches the widest possible audience. Our focus on generating impact via press coverage and social media gives papers the opportunity to be discovered. The article publishing charge (APC) for papers accepted by Heliyon is $1,250 (plus VAT and local taxes where applicable). 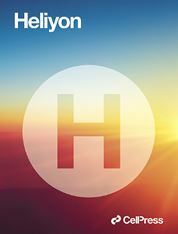 Visit Heliyon.com to learn more.